Disclaimer: All of these photos are the property of Just Happiling, and you may not use them without permission. All content in this blog post is my own personal opinion, and is not intended to offend, or send a negative message about a particular situation. We all have different lives, and some lifestyles work for some individuals and others to other individuals. As some of you may know, I have been living in Southern California for over 7 years now. It took a while to get used to the weather here, but I was definitely open to the idea of exploring a different environment from that in which I grew up in. However, after my husband and I got married, our intentions were to move to a different location. Nonetheless, there are things in life that you can't control much and plans change, or get stalled for a while. We finally decided that this year we are trading palm trees for pine trees, and we are moving to The Centennial State of Colorado. 1. The Weather - They don't call it The Sunshine state for nothing. It's taking me forever to get used to the brightness of the Sun in "sunny" California. You have to understand that when you grow up in a place where you have the four seasons, and you then go to one where it's Spring/Summer all year round, it takes a while for you to adjust. I finally understood what a migraine was, and never thought I had to avoid going outside without proper protection. I've really appreciated the value of umbrellas and sunglasses while living here. Added to that, the dryness of the Santa Anna winds, that don't do justice to our skin. And hey, my skin is supposed to be a tat oily, and yet, I can see how I am slowly turning into a prune. It works wonders when I am trying to preserve flowers, but hey, I don't intend to live forever myself. 2. Public Transportation - Everything is so far away, why? I don't feel ashamed to say that I don't drive. I am terrible at it, and I feel comfortable saying that it is best that I don't do it, at least until I feel more familiar with the area. But the reality is that I am a nervous/paranoid driver and highways would probably give me a heart attack right then and there. I never really needed to drive before I moved here. I always had a ride anywhere I needed to go, or there was reliable public transportation to take me to my destination just in time; nothing would take me longer than an hour. So you can imagine my surprise when I realized that to go somewhere that only took 20 minutes by car, could take me 3 hours by bus; I was shocked. Wait WHAT? Are you serious? Yes, public transportation is horrible here in the matter of destination. However, I do have to say that the ride by bus is great as a tourist. It's comfortable, they don't speed, the drivers tend to be nice if you are respectful, and you can enjoy the scenery. But to be honest, I didn't like rushing to take a bus two and a half hours before school, just to be able to make it on time. 3. Economy - California is a very expensive State, and it's only getting started. While, I understand that a life of luxury is supposed to be pricey. I don't get why a simple life has to be as well. We try to budget as much as we can, and yes, we enjoy of a couple of perks in life. However, I believe that if you have a good paying job, you should be able to make enough to save money for the future, and that is definitely not going to happen for us here in Cali. The other thing to consider, is that prices of land are skyrocketing, and we couldn't even begin to attempt to buy land to build our farm. It would be nearly impossible, and that saddens me, but it also gives us the opportunity to start fresh somewhere else. Somewhere, where lifestyle is more affordable, and you can still enjoy the beauty of life instead of always living on a budget. It pains me a little to say it, but; sorry California, it's not you, it's me. Or is it? 4. Distance - Oh boy, here I go again--ha ha. As I have mentioned before, the places we like to go to are too far away. Unfortunately we live in Escondido. I say unfortunately, because we are right in the middle of the best places to go visit, making it hard to be there when you just feel like it. Although there are a few things to do here in Escondido, the touristic places are all about an hour away or more from here. If we want to go to Balboa Park, or La Jolla, or just hang at the beach, it has to be planned., making sure we can avoid traffic as we cross a couple of cities to get there. Nonetheless, I think that when you are driving back and forth every day of the week, just to fulfill your work duties, the last thing you want to be doing on your day off is driving. Even if you are a great driver, driving adds stress to your body. Yup, you can't fool me. So it just saddens me that going to these beautiful places is not as easy as it may seem. It's funny when you think about it, because many people think that because you live close to the coast, you must spend a lot of time at the beach. The reality is that, because we have busy lives and we don't live right next to the ocean, we end up going only about a hand full of times a year. Not that long ago, one of my neighbors was really surprised to hear that I had never gone to Disneyland. I know that people travel across the world to go to Disneyland, and believe me, I've wanted to go ever since I was a little kid, but it is expensive, and a long drive. Plus knowing myself, I would probably want to buy EVERYTHING, and that could end up terrifying my husband. Wait a second--maybe that's the real reason why we haven't gone to "The Happiest Place on Earth" yet, hmm. Well, it's still a long drive, and for people that know the traffic up there, you know you might not be as easily convinced without children. 5. Earthquakes & Fires - OMG, this scares me to bits! I am not saying that there are no natural disasters in the East Coast, because Hurricane Season starts in May and ends in November. However, you always get warnings with that kind of weather. As I have learned, ever since I moved to California, both earthquakes and wildfires can happen unexpectedly and are very unpredictable. Although we have been lucky that all earthquakes felt in the area ever since I have been living here, have been lower than 5.1 in the Richter scale, every time we have one, I can't avoid praying it's not a foreshock leading to the infamous "Big One". With the fires, I remember watching the news back in Mexico, and always worrying about the affected people in the West Coast. It was always a horrifying view, almost like taken out of a horror movie. But you never really understand how serious this is, until you live here, and have to be evacuated. A couple of years ago, several wildfires were started all over the San Diego County. It was very stressing, because with my husband working two cities away, I worried that we would end up being separated by a fire. 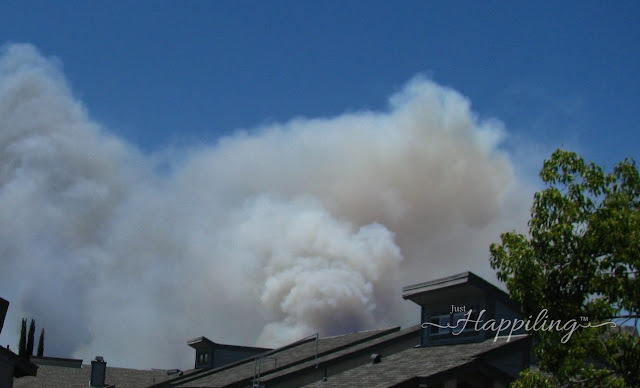 Not only because these fires were crossing the highway that connects the cities, but also because they were just happening randomly, one of them, getting way too close to our home. Even if we were blessed enough with not loosing our home, not everyone was as lucky. I can only imagine how horrible it must be to have to run for your life, and lose everything you own. As a collector, and holder of family heirlooms, I would be devastated if I was in that situation. Although I agree that material things cannot replace a life--ever, living here has always made me feel like I cannot fulfill my role as a keeper of family keepsakes. Not a good feeling for someone like me. Overall, what makes me the happiest about moving, is not necessarily the negative or frightening situations that SoCal may have, but the opportunities that opening another door as we close this chapter will bring. Every place in the world has it's pros and cons. Now that you've read the reasons why I am happy that we are moving to a different place, where we can try to have a different experience and lifestyle in hopes of being able to plan for a better future. I'd like to share with you, that there are also wonderful things about living here, which I am going to miss terribly. Things that I love to do, but would have to wait until we come back to visit our family here. 1. The Ocean - Although we might not go as often as I'd like, that just makes every visit, a trip with loads of quality time. We've been able to go at different times of the year, because it can be enjoyed at all times in the Sunshine State. When you grow up about 5 hours from the Ocean, living only 1 away allows you to appreciate it more often. The fact that it is the Pacific, allows your experience to be something like a spiritual connection with Mother Nature. Why? Because you know that the immensity of the Ocean is right there, at your feet and as far as your eyes can see. I am terrified of sharks, that's the only thing that has stopped me from experiencing the joy of getting into the ocean like the rest of the Californians. But that doesn't mean that I haven't enjoyed every single time that I had the sand at my feet, and felt the breeze in my face. Call me crazy, but I believe in Mermaids, and I feel it's going to be harder to spot one in a lifetime away from the ocean. 2. The Wildlife - In my fascination with photography, the ability to capture wildlife in California has been a pretty beautiful experience. We are moving to a place where you can also find a lot of wildlife, however, totally different ecosystem. Going to the ocean, and randomly being able to catch a glimpse of a dolphin jumping, or the ever playful sea lions at La Jolla Cove, is merely priceless. Going to the park, and observing huge pelicans hanging out with ducks, is only possible, because we live relatively close to the coast. Having the ability to go to The Wild Animal Park, which is one of my favorite places, since the animals are not in cages, is something that I will miss with all my heart. We haven't gone in a few years, but I have great memories, and maybe I've just taken for granted the fact that it's so close to my home. I think I would love to go one more time before we move. 3. Balboa Park - One of the most incredible places to take a bunch of wonderful photos with your family for free. Great architectural concepts, beautiful foliage, music, entertainment, and many interesting museum exhibits. Events that allow you to interact with the community, and enjoy while having a great time. But most of all, the "Rose Garden", the place where my husband and I exchanged our I do's. I feel fortunate that I've been able to visit most, if not all, of the museums there. The only thing I missed was the Zoo, which is right next to this, beloved and close to my heart, park. 4. Cheap Airfares to Mexico - Being closer to the border than our future destination, makes it easier and cheaper to fly to the Mexican East Coast to visit my family. If I planned my trips with time, I could find tickets as low as about $100 bucks round trip. You can't top that anywhere, considering that my trips are to another country. However, hopefully our lifestyle changes once we movie, might allow me to save enough to still visit my family without feeling like I am selling an arm and a leg. Lucky for me, working in the Airline business for about 6 years, gave me enough experience to know how to travel, and save myself the most I can. There are so many perks you learn from working in the travel & hospitality industry. 5. Growing Season - In case you didn't know, we've been growing some of our food in our tiny garden. That is mainly the reason why we are moving. We can't afford to buy land to farm in California, so we are leaving to a place where we can, and we can continue to grow delicious organic food for a healthier well-being. However, the advantage of living in California, is that it's sunny all the time, and the weather permits to grow different crops all year round. 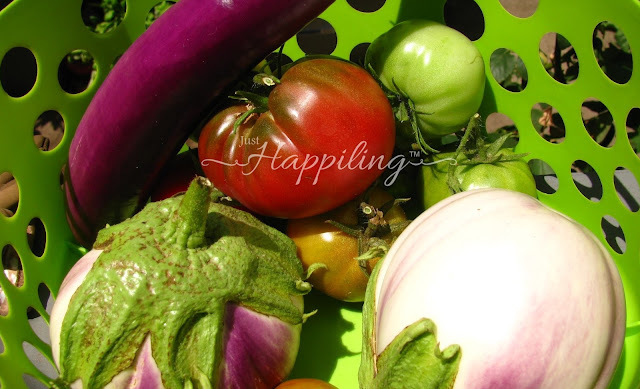 From tomatoes, egg-plants, peppers, cucumbers, and yummy herbs in the summer, to loads of salad greens, sweet peas, and other goodies in the "fall/winter" season. Mostly because it never gets cold enough to stop growing things. Organic food is expensive, so growing some of our own has helped a lot. However, our garden is super small, and the HOA doesn't like it when we have "a lot of plants". Moving will allow us to grow more plants, but since it snows, the growing season is going to be shorter and we are going to have to work it, and learn what grows best all over again. And that's it. There are many things that I haven't been able to do while living in Southern California, like; going to Disneyland, LEGOLand, Sea World, The San Diego Zoo, and Universal Studios. However, those wonderful places will still be here when we visit family, and by then, we hope to have children that can enjoy those places as much as intended. Yes, there are many awesome things about living in California, but we also realized that the lifestyle here, is not longer for us and we are very excited about giving Colorado the title of Home for a change. Everyone has things they like and dislike about where they live, and hopefully there are more of those you love than those you don't. Otherwise I would have to say that, maybe you are in the wrong place, and you should try to find what place makes you truly happy. We should be able to feel happiness more than half of the time, and comfortable with the area we live in. If you could choose anywhere in the world, where would you love to live? So what is the thing you love the most, and which other thing you wished you didn't have to deal with in your hometown? I'd love to know. Leave a comment below, and we'll love to read what you've shared. Like this content? Follow us through social media, and join us in our journey in pursue of happiness. Until next time, remember to smile, because it's contagious.